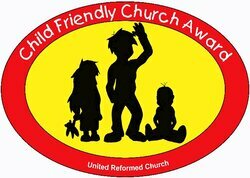 ​We were delighted to receive a Child-Friendly Church Award from the United Reformed Church in 2016. The national United Reformed Church write here that "By working hard to consider how all aspects of their life and work affect children and families, Child Friendly Churches are able to demonstrate that they are doing everything in their power to cater for the needs of parents, carers and young ones in their context. ​has a comprehensive and shared vision for children’s and youth work. provides good opportunities for the voices of children and young people to be heard. takes seriously and responds to feedback from children and young people. provides opportunities for children and young people to be involved in planning, organising and delivering child friendly church services. makes suitable provision for under 5s in church. provides groups and organisations to help nurture children and young people. takes Safeguarding, Health & Safety and First Aid seriously. Many thanks to all those who have contributed to the award application process over the past two years, whether collecting evidence, writing up notes, developing your own work with children and young people, or making sure that the buildings and resources available for young people are the best they can be. We appreciate the contributions - small and large - made by so many to achieve this award!